Weighty Matters – He Said What?! This morning Aaron walked into the kitchen while I was getting Gary’s lunch ready for him to take to work. I told Aaron good morning as usual, and as usual he didn’t respond in kind. The first words out of Aaron’s mouth were, “Mom! Do I look like I’ve lost weight?” Why waste time with a “Good Morning” when there are other more pressing matters to discuss…….like weight. Aaron has had a weight issue for much of his adult life. Some of it is genetics from my Hollandsworth side of the family. He has that stocky build, most definitely. And much of the weight issue is also from medicines that Aaron takes. Last year we weaned Aaron off of two medicines, and as a result he lost 65 pounds. We had lots of blood work done to check for any physical issues, but he was totally healthy. So we bought him new pants that were two sizes smaller, and he still had to wear a belt. However, he is now on a new medicine and has gained back some weight. He still looks good, and we don’t want him to worry too much about his weight, but it wasn’t lost on him last week at his seizure appointment that he has gained some weight back. Oh, Aaron. He thinks that we can tell from one single day to the next whether he has lost or gained weight, or whether he looks like he weighs what he does from day to day. If only it were that easy! Aaron loves his food. He not only loves eating it, but he loves to analyze it and talk about it and try to figure it all out, especially if the food is unusual to him. He won’t eat cotton candy, thankfully, but one day he described the funny cotton candy he had seen at the store. “It’s like the fluffy stuff inside a pillow!” he told me. “What are those round circle things at Long John Silvers?” he asked one day. We finally figured out that he meant hush puppies. 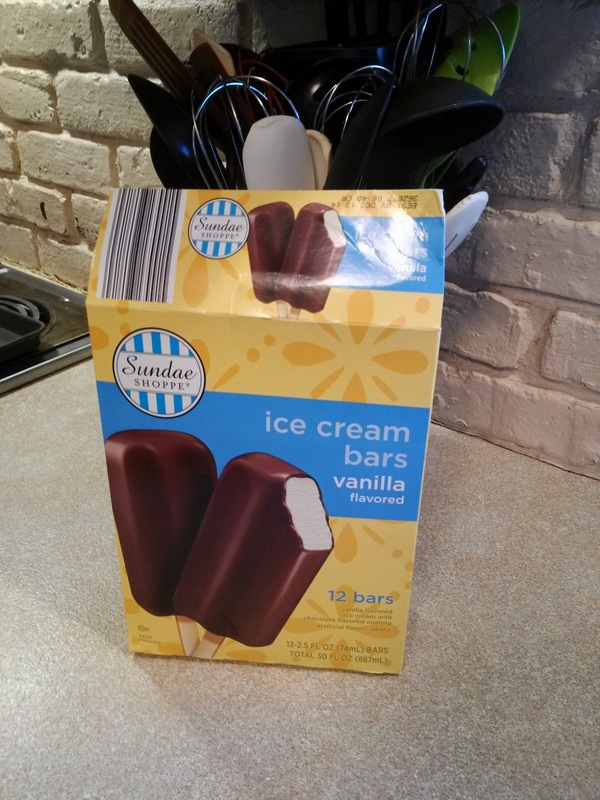 Aaron opened our freezer one day, and exclaimed, “You have the ice cream with stripes! You wanted striped ice cream?” That would be Neapolitan, in case you’re wondering. Aaron’s chocolate vanilla thing on a pole! Not with eating green doughnuts………or any other color, Aaron. He gave me a running list of what he had eaten one day when he returned from Paradigm, his day group. He said they had doughnuts, and tornado chips [that’s Bugles, by the way], etc., etc. “I’m over full! !” he exclaimed. Moderation is always an issue with Aaron. We try and try to make him understand that it’s OK to occasionally eat a little of something, but not a huge amount. He usually wants the super large of everything, or multiple bags or boxes. Many of you will remember me writing about the #52 Slushie from Quik Trip that Aaron was always talking about, and how I finally realized it was a 52 ounce Slushie that Aaron always bought. The biggest of the big, of course! So why did you eat FIVE of them if they did not have a flavor?! “What do you want me to eat while I watch TV?” he answered. I almost asked why he didn’t just finish off the wrapping papers as well, but I thought I better not give him any ideas. We try to encourage good food, although I know that I allow more junk food than he needs. One day I was telling him once again that he needed to eat good food, like eating supper with us instead of snacking during the day and again at night. “So what are you having for good food tonight?” he asked. Sometimes after a seizure, he loses his sense of taste for awhile. One day he said, “Mom, I think my mouth is sick.” So even though Aaron tends to eat too much food, we don’t like it when his mouth is sick. Sure I understand, Aaron, about as well as I understand you most of the time. Still scratching my head on that one the same as I scratch my head concerning Aaron so often. He still doesn’t understand why I shake my head, walk away, and head for the chocolate. Aaron better not say one word about MY weight! Previous Previous post: Will You Be My Partner?